The study of biomedical science in the UK is becoming increasingly popular, at both undergraduate and postgraduate level. Although the broad focus of all courses is on the understanding of disease mechanisms and their diagnosis, courses differ from institution to institution. So how do you pick the right one for the career you want? Laboratory tests or a more holistic approach? Some courses concentrate on the laboratory tests that are carried out as part of routine service work in hospital pathology laboratories. The content of these courses is usually based on histopathology, blood sciences, medical microbiology and immunology. They prepare you for work in hospital diagnostic laboratories. Other courses integrate aspects of clinical and routine laboratory diagnosis with a holistic view of biomedical sciences. They include details of the cellular and molecular mechanisms of disease and of the analytical techniques that are used to study these mechanisms. These broader courses prepare you for a wider range of careers, including university research, government-funded research laboratories, and a whole range of careers in the global pharmaceutical and biosciences industries. For the best career opportunities when you graduate, it’s important to look for a course that’s accredited by the Institute of Biomedical Sciences (IBMS). They look at course content, the quality of teaching, the learning environment, research activities and the facilities available. 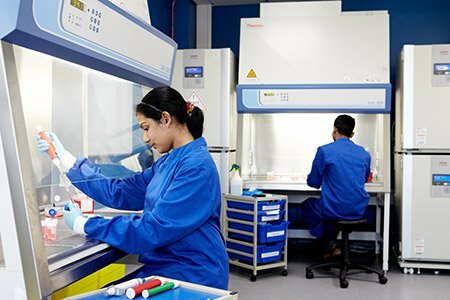 For a course to be accredited it must integrate a basic knowledge of human biology, cellular and molecular biology and analytical techniques with the specialist subjects of blood science, cellular pathology and medical microbiology and immunology. An accredited department is expected to support its teaching with research activity in relevant areas of biomedical sciences. Another key factor to improve your employability is the development of practical skills. All biomedical science courses should contain a considerable amount of practical work. In some universities this work will support the academic subject material, while other universities have developed practical scenarios which reflect what happens in the working world. 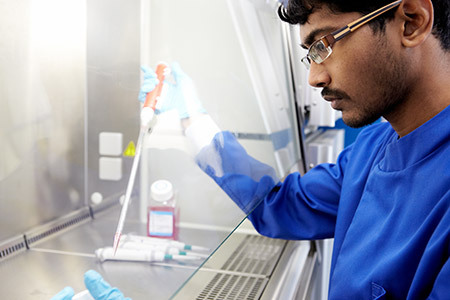 Increasingly, those biomedical scientists involved in routine analysis as well as research will use many sophisticated techniques, such as cell culture, quantitative analysis of DNA (real-time or q-PCR) and analytical techniques such as HPLC and mass spectrometry. Courses that give you hands-on experience of these techniques will enhance your employability skills and give you the best start to your career. Another important aspect is the opportunity for you to carry out a research project. This enables you to develop problem-solving skills and the ability to work independently. It also gives you an opportunity to work at the cutting edge of biomedical science and to contribute to advances in the understanding, diagnosis or treatment of disease. So to find a biomedical science course to suit you and your career plans, look for IBMS accreditation, practical work and research projects, and check the course content. They’re all key factors in helping you gain the skills that employers want. Previous articleLet’s Go Back to Uni! Next articleHow to Apply Science in Sport and Exercise?